Grace, grace, God’s grace, Grace that will pardon and cleanse within; Grace, grace, God’s grace, Grace that is greater than all our sin! Oh yes, God's marvelous, infinite, matchless grace of our loving Lord is truly freely given to all who are willing to receive it. And as intentional Christian grandparents, not only do we need to be quick to point our dear grandchildren to this grace which is available to them, but we need to be quick to show grace to them as well. When they "mess up", and just like their grandparents, they will mess up from time to time, we need to give grace and forgive them. 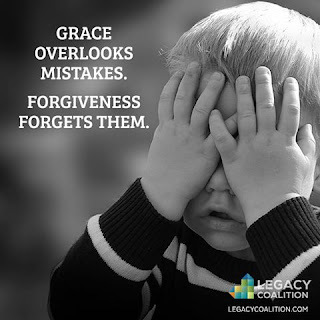 We must not hold over their heads past poor choices, because when they see and experience this grace from their grandparents, they will be much quicker to identify and want it from God as well! Be a grandparent who is known by their grandchildren for the way they are quick to give grace.